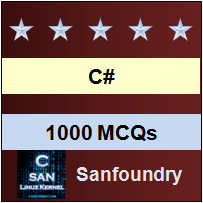 This section of our 1000+ C# multiple choice questions focuses on while loop statements in C# Programming Language. Explanation: Since, condition never satisfied for any value of i and j for which (i % j == 2).Hence, j is always constant ‘1’ and ‘i’ increments for i = 1, 2, 3. Explanation: For the first while condition check when s = 0. If it is true as control goes inside loop ++s increments value of s by 1 as 1+0.1 = 1.1. So, for next condition while loop fails and hence, prints final value of s as 1.1. Explanation: For while(i++ < 5) current value of ‘i’ is checked first and hence prints incremented value afterwards.So, i =1, 2, 3, 4, 5.But, for while(++i < 5) current value is incremented first and then checks that value with given condition and hence then prints that value.So, i = 1, 2, 3, 4. Explanation: Inner while loop condition checks for even number between 0 an 10 and hence prints number between the given range. 0 2 4 6 8. Explanation: Checks condition if number is divisible by 2 then it will print it even number times as given for x = 8 so, prints between 2 to 8 times Similarly, for x = 5, Execute 2 and 4 time. Explanation: Reverse of number using while loop. Explanation: for while(i = 1.0f and j = 0.05f). We, had ‘&&’ condition which gives ‘1’. So, control enters while loop. Since, i = 1 and i++ = first execute then increment. So, first with ‘i’ value as 1.0f and ++j = first increment and then executes we had j = 1.05f and Since operation (i++ – ++j) gives us a negative sign number. So, we can stick our choice to option ‘c’ clearly. Now, as i = 2.0f so loop breaks. Explanation: As ++i, first increments then execute so, for ++i i is 11 and j++ is first execute then increments. So, j = 10. Explanation: Ascii value of ‘A’ is 65 and ‘a’ is 97.So, clearly ‘A’ < ‘a’. Explanation: i++ = first executes then increments as i = 0. So, i++ != 0, which is false clearly as i = 0. Now, control goes inside loop with i = 1. So, statement prints i = 1.